Advanced controller and dynamic performance sequencer. BeatStep Pro is your main performance hub to gear of the future, and classic hardware of years past. 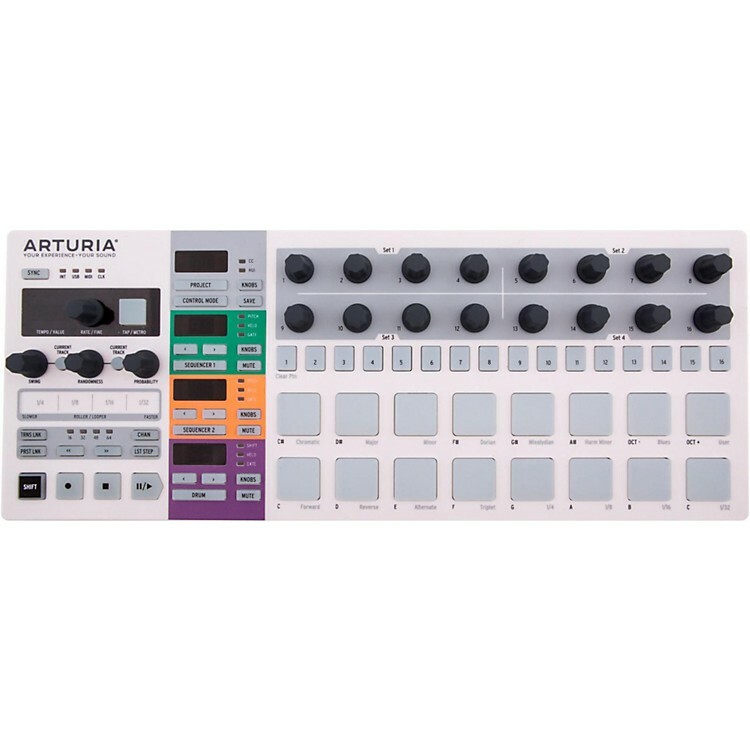 Designed for hands-on hardware sequencing, BeatStep Pro combines two fully independent melodic sequencers with up to 64 steps per sequence, and one drum sequencer that allows for 16 separate tracks of sequencing. Beyond sequencing, BeatStep Pro also incorporates on-board performance effects. Designed for hands-on hardware sequencing, the BeatStep Pro brings two fully independent melodic sequencers and one drum sequencer. You can manage a full performance controlling software instruments, analog and digital synthesizers, drum machines and drum kits, and iPad apps from the BeatStep Pro. The melodic sequencers offer up to 64 steps per sequence, 16 sequences per project and 16 projects, making them aomg some of the best step sequencers ever made. The additional drum sequencer allows for 16 separate tracks of sequencing. Record in real-time via the pads or use the step buttons for a classic drum machine workflow. As if all this were not enough, There's also a number of performance effects added such as a looper with touch strip, randomizer, swing settings and other hands on control possibilities that are sure to make this a modern classic. The controller mode allows you to trigger clips in your favorite DAW, play drum sounds in a module or adjust parameters in your favorite plug-in. The possibilities are only limited by your imagination. With USB, MIDI in and out, CV/GATE outputs, and Clock in/out that can work as a 1:1 clock with an external clock generator or DIN sync, the BeatStep Pro goes well beyond where some other sequencers leave off. Use BeatStep Pro with large modular synthesizers, current digital synthesizers, and your computer. Master performance control for all of your synths, old and new. Order today!